There is an imminent cash crunch in the economy now, small town India never really recovered from demonetisation, and it had to deal with GST, Manpasand Beverages Chairman Dhirendra Singh says in conversation with Business Today. 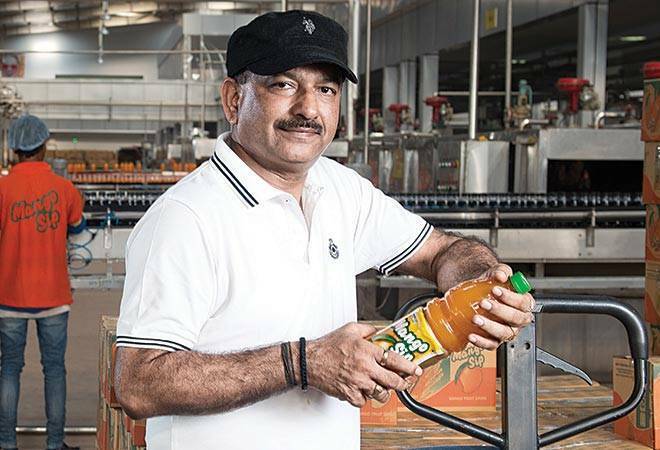 Dhirendra Singh, Chairman of the Rs 750-crore Vadodara-based Manpasad Beverages, takes pride in calling his flagship brand, Mango Sip, a beverage of the masses. Singh spends a large chunk of his time travelling to the heartlands of India just to understand consumption patterns. In a conversation with Business Today's Ajita Shashidhar, Singh talks about how policies such as demonetisation and GST have impacted the regional economy. There is an imminent cash crunch in the economy now, but Singh believes that small town India never really recovered from demonetisation and it had to deal with GST. The results of most listed consumer products companies shows robust growth in the GST era. Has this growth come at the expense of the regional economy? You only see the positive side of things. In India 70-80 per cent happens through wholesale. As you go to tier 2-3 towns, you will see that every small town or village has a wealthy businessman who manages the money of the other wealthy people living in that community. It could be the money of the local tehsildar or police inspector, who would have earned under the table. This businessman (usually a wholesaler), being cash rich, gets the advantage of bulk buying at a competitive price. So, he may buy sugar, edible oil etc, and then gives the local retailers extended credit. He also funds other small businesses. Almost 65-70 per cent of business happens this way and the total dealing happens in cash. The inspector and tehsildar obviously don't do cheque transactions. When GST happened, on one hand, there were wholesalers and retailers and then there were small manufacturers, who used to buy inputs from the market by paying cash, they never paid any kind of taxes. With GST, the entire value chain needed to have a GST number. They pressurised each other to have GST number as none of them would be able to take benefit of input credit. This led to closure of smaller factories and wholesale businesses also shut down. This entire unorganised chain which never resorted to any kind of billing and only did under the table cash dealings has completely crumbled. I met a person in UP, who was a wholesale dealer of fabrics, he had Rs 30-40 lakh worth of goods in the market when GST was announced. He used to source his fabrics from Surat without any billing, but the manufacturer at Surat refused to sell to him unless he had a GST number. He didn't get his supply of fabrics for over two months, and the retailers who he had given his fabrics on credit refused to pay him unless he gave them fresh stock. That person went bankrupt. He then tried to get a GST number and went to a sales tax consultant. This town had only one sales tax consultant who had increased his fee from Rs 200 to Rs 2,000. That's because no one understood what GST is, what are the advantage of set-offs. The small traders have got badly impacted because of GST. Small, regional brands have got completely wiped out. Bigger, organised companies such as ours have benefitted a lot, but GST has been death-knell for local businesses. To get a GST number one needs to submit one's PAN card, Aadhaar card and people are scared to submit these documents because they will come under the tax bracket, which they never paid. Demonetisation preceded GST, what kind of impact did that create in the smaller markets? Due to demonetisation all the money that was there in the market came back to the banks. Hence, the wholesale market has no money at all. A small trader, who had Rs 15 lakh cash with him, went and deposited his money in the accounts of his family and friends so that the money doesn't lose its value. After depositing, he was scared to withdraw the money and this resulted in excess cash with banks. Money got blocked, and there was no money in the market. While you may think life is normal now, but there is still no money in tier 2-3 markets. Anand (in Gujarat) for instance, is a small town, but there is no money there. People usually bought gold in order to convert their black money to white, or buy land, all that has stopped too. Government's tax collection will surely go up, but the Indian model of doing business has got fractured. The village economy totally operates on cash, not on credit card. If a farmer gives Rs 10 to a shopkeeper in a village, that shopkeeper gives it to the distributor, the distributor by evening will have bulk cash which he would have collected from other shopkeepers and he would give that money to the stockist. Now there is a brake on such transactions. Most people in villages do small cash dealings, and they obviously can't pay by cheque. So, GST on the face of it may sound like a great move, but there is an entire economy which lives in villages that is badly impacted. You like to call yourself a brand of the masses and I am sure you deal with the wholesale community. Hasn't your business got impacted too? Even we go to them as they are our buyers, so we are also impacted. In the month of December we have a booking scheme, when we give 10 per cent discount to all those (wholesalers) who book our products in advance. Earlier, there used to be an overflow of bookings, this time we got only 28 bookings, as there was no cash to pay. We used to get booking worth Rs 100 crore, but this time we struggled to touch Rs 50 crore. That is because the market doesn't have surplus money. You have given us lot of insights on how the small town economy has got impacted. Can you tell us how small local brands have got impacted? Let me give you an example of packaged water. There are thousands of local bottled water brands who never pay taxes. Earlier there was 26 per cent excise and VAT on bottled water, which these brands used to save. They used to sell at least 30 per cent lower than the big brands. Now it's the reverse, the bigger brands are more reasonably priced. Now there is 12 per cent GST on bottled water, but it has become expensive for the local brands because they have never paid taxes. They are out of business.